I've always said that in life one should know their strengths and weaknesses. As a child, I was never good at craft projects. I could never follow the paint by numbers properly. The blues always ended up where the reds were supposed to be, the yellows where the blues were supposed to be...and so on. While everyone else held a perfectly painted portrait of a unicorn, my painting always looked like a rhinoceros with the mange. In the fifth grade, we made some Christmas wind chimes from can goods tops. Our teacher helped us with this project so that we wouldn't get cut...she crimped the edges of the can tops, punched holes through the centers so that we could run the ribbon through, and helped us tie the pretty bow on top. I was so excited by the fact that I was going to have a nice craft project to carry home to my mother for Christmas. On the bus on the way home, I sliced my knee open on one of the can tops, bled all over the chimes, tore up the ribbon and had to be carried to the ER for a tetanus shot! Merry Christmas to us! So WHY do I continue to tempt fate? I suppose I feel as though I have something to prove to the universe. 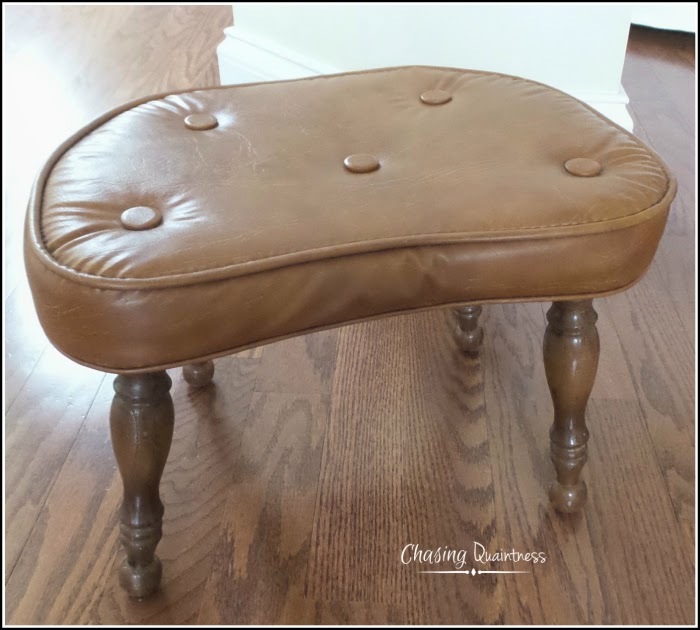 My current failure started like this -- a 1970's brown footstool I picked up at the flea market. I had a vision. I'm learning that this is where the trouble always starts...with one of my "visions". 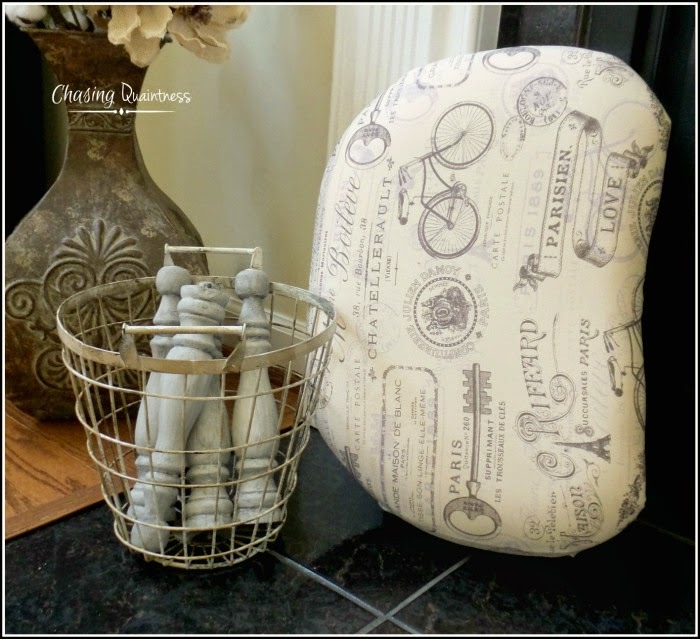 I envisioned a cute little stool sitting by my fireplace....soft and inviting....with a little basket of wood next to it (it doesn't matter that we have a gas fireplace -- the wood is for looks). 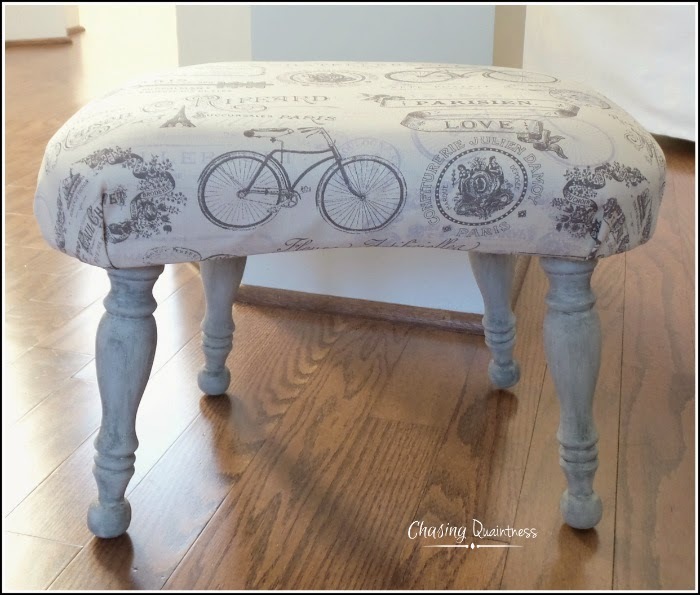 Mistake #1 - give the stool a face lift. Since it was in great shape, I wanted to preserve the basic elements (not ripping apart the top) in the event I decided to choose a mid-century modern look for our home sometime in the distant future. I went to JoAnn's Fabrics, found some neutral material for a song, picked up some foam to enhance the padding and returned home to begin the massacre. 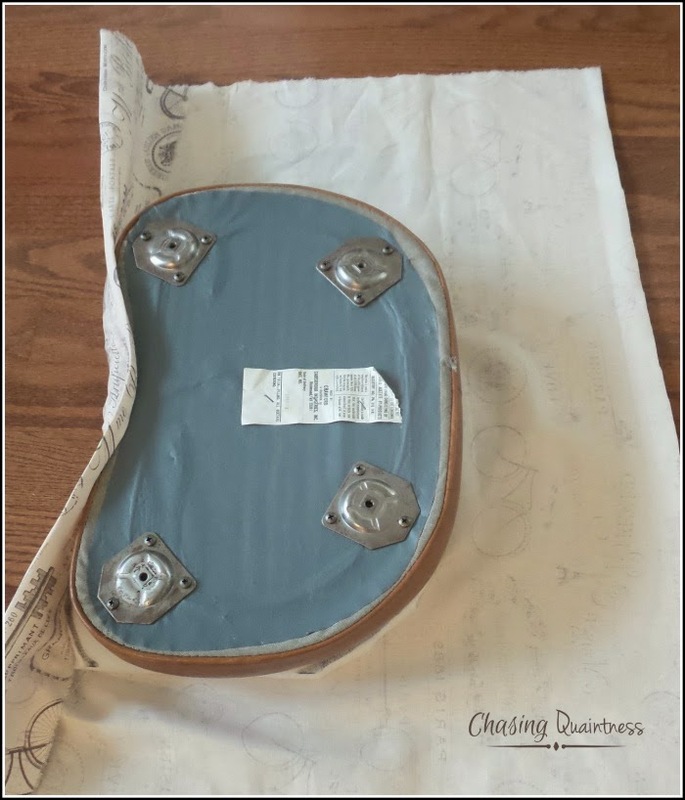 I removed the legs, traced the outline of the stool top on the foam padding, cut the material and we began the recovering process. It went well. I was excited and encouraged. 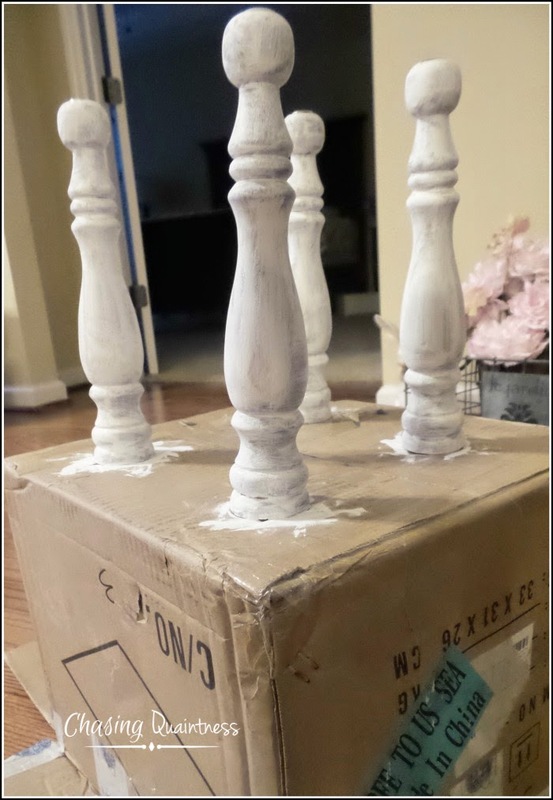 My husband even fixed this box for me so I could paint the legs. The painting went well. No drops, spills, runs or smudges after 3 coats. I could see the light at the end of the tunnel. This was not going to be an epic failure. It would be a successful project, one that I write about with pride. The legs dried and I put them back on the stool to take my "completed" photos. I turned the stool right side up, took one step back and felt the slap of Mother Universe right in the side of my head. It looked awful!! What possessed me to paint those legs stark white with a beige-colored material??!! The vision, I blame the vision! You can see for yourself what a horrible look this is - not what I was going for at all. I should have bought the red material that first caught my eye and the white legs would have been great. So back to the drawing board I went. I removed the legs once again and decided to brush some stain over them to tone down the white. Mistake #2. The project went from bad to worse, quickly! I kept telling myself the legs would look better once they dried. Nope, didn't happen. I put the legs back on the stool to take this photo. My husband said the stool legs were a pretty shade of gray, all goth-like, and would probably look very nice in a haunted house at Halloween. He's so supportive. So, by now, I am sure you are asking yourself, "How did it finally turn out? What did you do?" The answer: the stool is sitting next to my fireplace with a basket of wood (for looks) next to it! I will post photos when I give the legs another go this week. Right now, I just want someone to come shoot this "stool pigeon" and put it out of my misery! If you drive by my house, you may find it sitting on the curb with a "take me home" sign nailed to it! 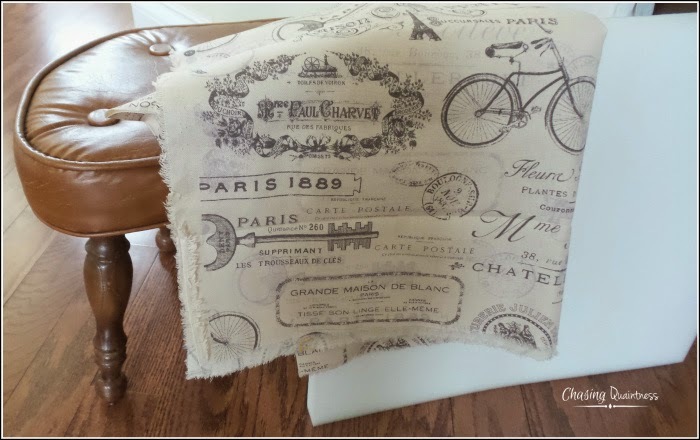 Shared on the link party at A Stroll Through Life, Savvy Southern Style, Kammy's Korner, Canary Street Crafts, the Cottage Market and Cozy Little House! Oh, Benita, you are so funny. The stool pigeon is not a failure, just a work in progress. 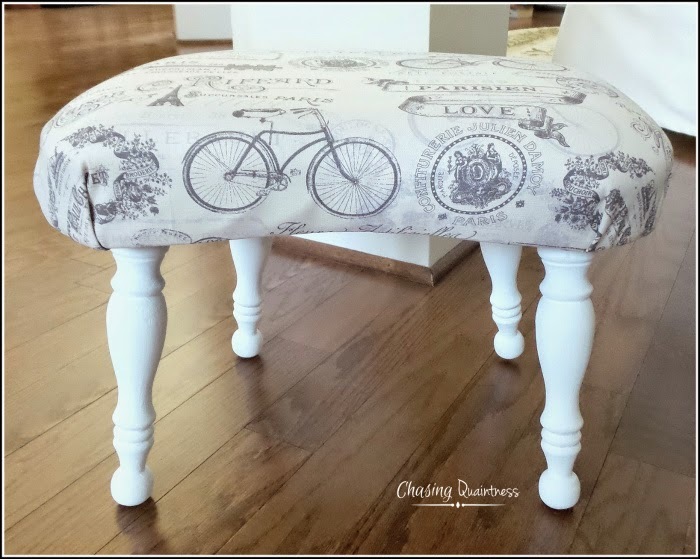 You can continue to layer paint on the legs until you get the color you want. I have that same look in my living room times five. Legs stacked like cord wood and table tops lining the fireplace. Thank you Donna! LOL..@ legs stacked like cord wood. We can commiserate together! It is definitely a process and I will try again later this week. I'm just too frustrated to fool with it right now. I actually think it looks cute, but how about painting the legs black? Thank you! LOL…. Girl, I was so frustrated, I wanted to burn it immediately! It is still sitting in the same position as when I took the last photo! Black might work with that material. I didn’t think of that. Will give it a try! Laughing out loud when I saw the "basket of wood for looks." Judith, just so you know, the legs are still in the "basket"...LOL I've put that project way on the back burner! Thanks so much! You are too funny! I'm in love with that fabric and I honestly didn't think the legs looked bad! Although they do look pretty nice in that basket :). Can't wait to see what you finally decide to do with them. I sure hope so...I don't think my bruised ego can take much more...LOL. Thank you so much and I hope you have a wonderfully blessed Easter weekend! Ha ha-good read! I have projects that are just sitting some place waiting for the Re-do fairy to try again too! Spray paint. Flat black. It's your friend.